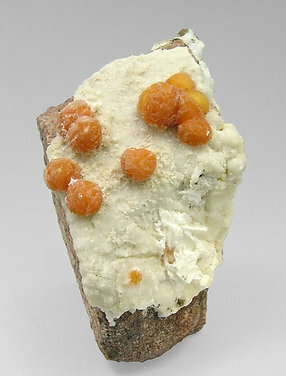 Very defined and separate globular growths on a concretion of white Calcite that coat the rocky matrix. The especially deep orange color belongs to the magnesian species, even considering that the sample has not been analyzed. Excellent Ferrierite specimen from the most classic and best-known locality for this rare zeolite. 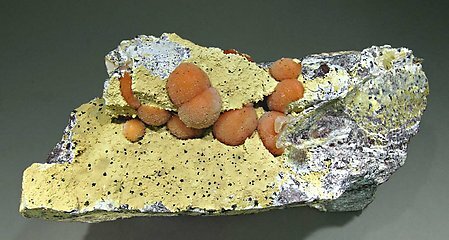 It shows globular, near spherical, growths with a nice orange color that contrasts on a matrix covered by white globular Calcite crystals.